COSIT'03 was held in Kartause, Ittingen, in Switzerland. 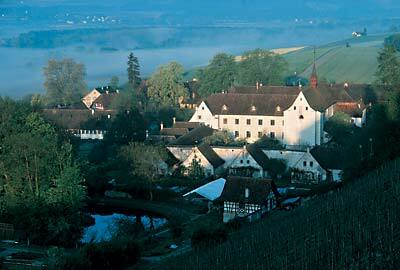 Kartause Ittingen is situated in the Thur valley near the city of Frauenfeld. Ittingen began as an Augustinian monastery in 1152, was taken over by the Carthusian Order in 1462, secularized as a private farm in 1848 and restored to its former glory by the Charterhouse Ittingen Heritage Trust founded in 1977. The Ittingen Charterhouse today encompasses the Historical Museum, the Thurgau Art Collection, a sheltered workshop and residence and the Cantonal Protestant Study Centre. Extensive agriculture, cheese-making and viticulture are also Ittingen activities. There is still a little of the medieval atmosphere in the Charterhouse. The objective is to provide something of the former Carthusian solitude besides satisfying modern comforts and needs. The best way to get to Kartause Ittingen is by direct train (40 min) from Zurich International Airport (ZIA) to Frauenfeld and then by call bus (10 min) to the front door of Kartause Ittingen. Timetables for trains between ZIA and Frauenfeld can be found by following on the links on the right. For the duration of the conference we have organized a shuttle bus from Frauenfeld station to Kartause Ittingen. Please let us know when you will arrive in Frauenfeld, such that we can plan accordingly. Participants with disabilities should contact the organizer to arrange for the trip from Zurich airport. Finally, there is an alternative concise description of how to get to the conference from Zurich airport here, which you may find useful.